There’s no denying the Japanese have made an art of gastronomy, especially when it comes to artisanal cuisines such as kaiseki and sushi. And like any art form, the creations of a true master can fetch astronomical prices. 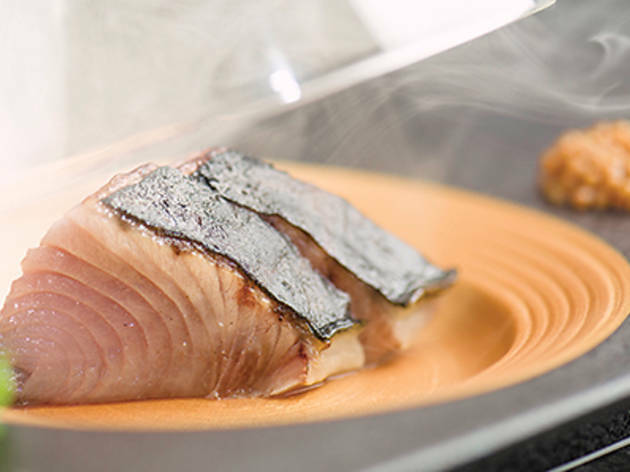 A wave of prominent omakase restaurants have hit Hong Kong in recent times. The traditional concept of letting the master chef serve you whatever he or she deems fit has proven so successful it’s spilled over to contemporary eateries such as Yardbird and Chino. Hong Kong’s sushi omakase restaurants typically hire chefs with decades of experience, but new restaurants of this category are increasingly being helmed by young local chefs who apprenticed in esteemed kitchens such as Sushi Shikon. Raki is the next step in the evolution of omakase on our shores. A Sushi Ta-ke alum, chef Jack Yan was formerly head of the kitchens at locally-owned omakase restaurant Kishoku. Now, with the title of executive chef, Yan has established his own project and leads the kitchens with his hand-picked team. Located on the 15th floor of Cubus, in Causeway Bay, the décor follows the same clean lines and pine wood furniture of many a high-end Japanese eatery. There are three options on the menu and you can choose to spend $1,400, $1,600 or $1,800 on your meal. The latter two options include items from the hot kitchen – and the prices reflect those of a sushi master. We select the mid-range option to sample the cooked items, and we’re informed we’ll start with eight appetisers, a cooked dish and then seven pieces of sushi. Exactly what the dishes are, however, is entirely up to chef Yan. Our $1,600 certainly pays for a lot of food. Noteworthy dishes include sea urchin with Kyoto silken tofu, which sounds simple but involves laboriously infusing fish stock into the accompanying soy sauce for more than four weeks. The combination is heavenly. The sauce is barely noticeable, subtly highlighting the sweet briny flavours of the uni, which is perfectly rounded off by the nutty tofu. The textural difference between the two primary ingredients is undetectable. Another winner, the oak-smoked hamachi, is presented with some theatrics. 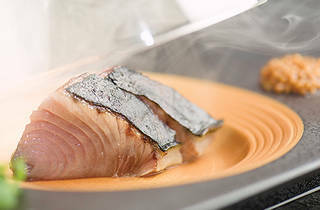 Sitting in a glass dome, the sashimi is infused by vapour from a smoke gun and the fumes are released by lifting the cover. The notes of oak are strong, albeit fleeting, and we enjoy chef Yan’s innovative method of finishing the fish. The cooked dishes are where the quality of the meal starts to dip. We’re served a crispy grilled snapper, where the scales are deep fried and the meat of the fish grilled. The balance between crunchy and tender is successfully achieved. For all that, the skin is separated from the flesh when served, and we feel that, for over a $1,000 a person, a true master would not have allowed this to make it to the table on the basis of aesthetics alone. The most disappointing small plate is the fish liver. Supposedly served on a bed of vinegar and kelp, the acidity is totally out of whack, making the finish hair-raisingly acerbic, complete with a fishy taste so strong it’s equivalent to cod liver oil. Someone definitely didn’t taste their dishes before serving. Things regain an upward trajectory with the sushi courses. The highlights are the ‘slow-cooked’ oyster, where the bivalve is immersed in 50 degree water for 10 minutes, stripping away any sliminess and transforming the shellfish texture to perfectly match the rice. A tiger prawn is cooked to a crunchy texture, and rather than being served flat on top of rice, it’s hollowed out and the sushi rice is infused with its fat and stuffed inside. Top notch stuff. Raki 15/F, Cubus, 1 Hoi Ping Rd, Causeway Bay, 2782 0010; fb.com/rakisushi.